ATLANTA, GA – October 2, 2018 – NAI Brannen Goddard, a leading provider of commercial real estate services, is pleased to announce that the firm has successfully arranged the sale of a 2.86-acre corner site located in Atlanta’s Central Perimeter. The property is strategically located at the southeast corner of Ashford Dunwoody Road and Perimeter Center East, directly across from Perimeter Mall and within walking distance of MARTA Dunwoody Station. NAI Brannen Goddard managing director Stan Williams marketed the property on behalf of the seller, Rubenstein Partners. The property sold to DJ Perimeter, LLC for an undisclosed sum. The future development site is made up of three parcels within the Central (Dekalb) Perimeter Community Improvement District (CID) and the Livable Centers Initiative (LCI): Perimeter at The Center – Future Focus 2011. 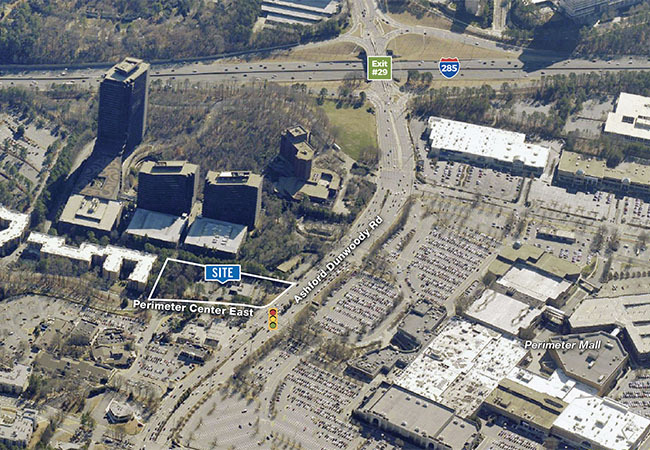 Central Perimeter is the largest office market in Atlanta and home to more than 5,000 companies. Nearby recent developments include State Farm’s Park Center and Mercedes-Benz US Headquarters. NAI Brannen Goddard is a privately-held commercial real estate firm, which provides a wide scope of services to regional, national and international clients. Our services range from leasing, investment and land sales to management services. Founded in 1978, our firm provides businesses, owners, and investors with top-tier real estate services and effective solutions for maximizing profitability and performance levels. NAI Brannen Goddard is the Atlanta-area representative for NAI Global, the world’s largest managed network of real estate service providers with more than 400 offices strategically located throughout North America, Latin America, Europe and Asia Pacific, with over 7,000 local market professionals, managing over 425 million square feet of property. To learn more about NAI Brannen Goddard and NAI Global, visit naibg.com.